At UF, each digital / data collection is affiliated with one or more Curators or Program Directors, with collaborative support from the UF Curator for Digital Collections and/or the Digital Scholarship Librarian and/or Digital Development & Web Services. Information on the quality control (QC) application within SobekCM for reviewing materials, assigning table of contents, pagination, divisions, and other enhanced metadata. 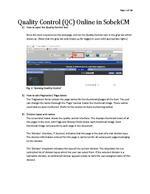 Page 1 of 10 Quality Control (QC) Online in SobekCM 1) H ow to open the Quality Control tool Once the item is opened on the webpage, click on the Quality Control icon in the grey bar which shows up. (Note that the grey bar only shows up for logged in users with appropriate rights .) Fig. 1. Opening Quality Control 2) How to edit Pagination/ Page labels The Pagination field s contain the page name s for the thumbnails/pages of the item. The user can change this name thorough the Page textbox below the thumbnail image. These names could also be auto numbered. ( Refer to the section on Auto numbering below) 3) Division types and names The screenshot below shows the quality control interface. This displays thumbnail views of all the pages in the item, with Page and Division fields below each thumbn ail image. Each thumbnail image corresponds to each page in the document. The Division checkbox, if checked, indicates that this page is the start of a new division type. The division information entered for this page is carried on for all subsequent pages belonging to this division. The Division dropdown indicates the type of the current division. The dropdown list is a controlled list of division types which the user can select from. If the selected division is a nameable division, an additional tex tbox appears below to hold the user assigned name of this division. Page 6 of 10 Fig. 8. PREVIEW Screen while moving pages 6) Deleting pages As in the case of moving pages, there are 2 ways of deleting a page. a) Deleting a single page A single page can be deleted by clicking on the trashcan icon appearing at the bottom right of each thumbnail box on hovering over that box. This then prompts the user for a confirmation before deleting the page. Page 7 of 10 Fig. 9. a. Deleting a single page b) Deleting multiple pages Multiple pages can be deleted by clicking on the trashcan cursor control icon at the right of the QC menu bar. The user can then select the pages to be deleted by clicking and highlighting in yellow to select the pages, and then cl icking on the yellow DELETE button at the bottom right of the screen. Ctrl + Shift + C lick can also be used to select multiple consecutive pages with a single click. Page 8 of 10 Fig. 9.b. Deleting multiple pages 7. Uploading new pages To upload new pages within the item, click on the + (plus) icon on the right of the menu bar. This redirects to the Upload page. On the Upload screen, the user can browse to select the image to upload. Multi file upload is supported as well. By default, the new pages are automatically inserted based on the filename. It is hence recommended that the files be named sequentially, typically in a numerical format like 00012. The final page location can later be edited by the user as well. For .TIF files, th e .jpg and thm.jpg derivatives are also generated. Page 9 of 10 Fig. 10. Uploading new page images 8. Selecting a main thumbnail The main thumbnail cursor control icon at the right of the menu bar allows the user to select/ change/ remove the main thumbnail for the item. The main thumbnail is the thumbnail displayed for the item during searches and browses. To select a thumbnail, click on the image icon on the menu bar. The cursor will change to this image. Then select the page which you want displayed as the main th umbnail. The main thumbnail icon will appear on this page and this change will be reflected on save. To deselect, simply click on the page which was previously set as the main thumbnail. 9. Clear Pagination & Reordering Pages This option, available in the menu bar through Edit > Clear Pagination allows the user to clear all the pagination for the item.